There is something about spending every day with the same group of people, experiencing so many “firsts” together and connecting over shared experiences that often combine to create lasting friendships. Camp friends become best friends because the entire summer is spent in such tight community, that it is almost impossible not to form long-term relationships with many of the people you meet at camp. You enter your cabin as strangers, and by the end of the summer you’ve shared stories and secrets and inside jokes, you build trust and encourage each other and listen to each other. Camp friendships aren’t tainted by social media, they’re organic relationships built on shared interests and experiences, and they often last a lifetime. Some first-time campers worry about spending so much time away from home and away from their beloved smartphones. But if many campers knew all of the benefits of spending time outside and away from their screens, they’d be excited about all of the outdoor adventures waiting for them at camp. Camp Starlight is set on beautiful acres of land, surrounded by beautiful natural landmarks. Spending extended time outside allows you to soak in Vitamin D, breathe in the fresh air, and is great for your mental health. Any campers nervous about the amount of time spent outside at camp will quickly learn that camp is the best place to connect with nature. We know spending a summer away from home can be a little nerve-wracking, but veteran campers would tell you that there is nothing to worry about. 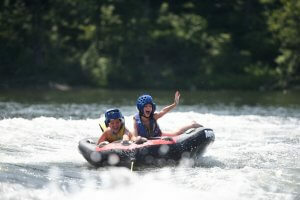 Campers who let their nerves get the best of them miss out on some great camp experiences. Counselors work hard to make each camper feel comfortable and at home as soon as possible. While it is normal to feel nervous when trying something new, it’s important to remember that camp is specifically designed to be the safest, coolest, most exciting place for kids and teens to spend their summer. There is a 0% chance that you’ll have a horrible time at camp, so there is nothing to worry about. The sooner you learn to lean on your fellow campers and counselors and work together, the more fun your camp experience will be. The people you share a cabin with quickly become like family, and counselors become trusted role models who work to ensure you have the best summer possible. The summer camp experience is meant to be shared, and you will have much more fun when you work together with other campers and counselors. New campers may be hesitant to ask questions, but if they know how ready and willing seasoned campers and camp staff are to help, they’d feel a lot better about seeking out help. Everyone at camp is there to help each other! It would be the time of my life! You will have many assumptions and expectations about your first summer at camp, but there is one thing you can know for sure: you will have the time of your life! Most campers get a general idea that summer camp is designed to be a fun place to spend a few weeks, but if you knew what was truly in store for you, you’d be jumping up and down to get here! Seasoned campers can tell you until they’re blue in the face about how life-changing summer camp can be, but there’s only way to really experience it, and that is to sign up for your first summer camp experience! There are many things you don’t know about camp until you get here. You won’t know many of the camp traditions, how to sing the songs, the fastest way to get to your cabin, or what activities to try. There will be many questions and a lot of things you will have to learn along the way, but if you can come to camp knowing these five things, you’ll be ready to jump into the camp experience! This entry was posted on Friday, December 7th, 2018 at 8:59 am	and is filed under Summer 2019. You can follow any responses to this entry through the RSS 2.0 feed. You can leave a response, or trackback from your own site.